Browsing the blogs I follow a few days ago, I came across Inari’s post about a pastel painting of Dobby (from the Harry Potter series) she is working on. Dobby was always one of my favorite characters, so we got to chatting, and we decided we’d each do favorite creatures and roll out our artwork together! How can you not love him?! He’s even got smile lines! Please check out what I’m most sure will be a heart-stopping version of Dobby over at Inari’s place this morning. She does such amazingly detailed work; I’m sure you’ll be inspired by whatever’s on her drawing board, be it man or beast! I had debby ‘dobby’ on my brain 🙂 either that or a bit of low blood sugar LOL. Thanks Jodi! I did hear about that, yes! I’m glad it’s amazing. It should be. I just love everything J K Rowling does. Have you read her books written for adults? I have not – do you like? Nice job. I was a bit confused as I read the text(Harry Potter) and glanced at the picture (gollum). So great likeness. haha, thanks! 😀 Love Gollum! LOL, no doubt! 😀 Thanks, C! Very nice. I especially like the ink sketch. 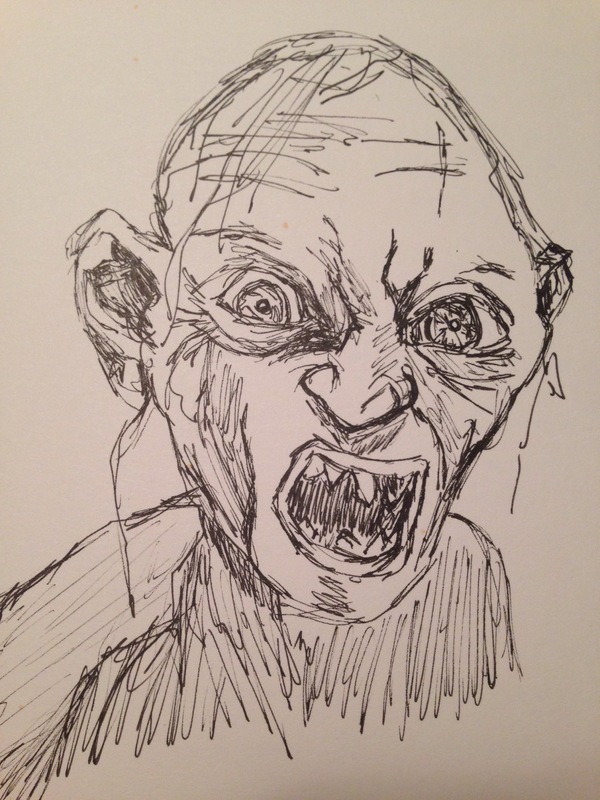 I think you really captured Gollum well with that one. He was my favourite when I first read the Hobbit as a child. I loved Riddles in the Dark and was obsessed with riddles for a while after that. It made me carry over my attachment to him into the Lord of the Rings when I read those books later on. Thank you. I loved all four books – to the point that I read them under the sheets at night with a flashlight. 😀 Fell in love with fantasy fiction at that point. It is amazing, and those Micron pens really make it a joy. Hahahahaha! I wasn’t expecting that greeting! Encore encore! That’s such a good likeness – scared me to death! Inari, sure enough, your comments were both stuck in spam. I know this happens to me too, when I go back to a post and don’t see my comment. Anyway, mystery solved! It would be fun to do this again. Are you interested in birds at all? Well, many of us will, I think, be celebrating Draw A Bird Day on July 8th. (It was originally April 8th, but some missed it, so we did it on May 8th and somewhat on June 8th…..I got the feeling people would like to try again on July 8th.) So if you’re interested, I’ll probably start cheerleading for that on July 1. We could pick something totally different for the next one. Something summery…..maybe florals? And then anyone who felt like joining in could just do whatever flower they wanted, in whatever medium? What do you think? No specific species or medium – you can choose any you like! I’m trying to improve my florals, but I’m up for anything, Inari. I’m learning about everything, so it’s all pretty new to me, really. 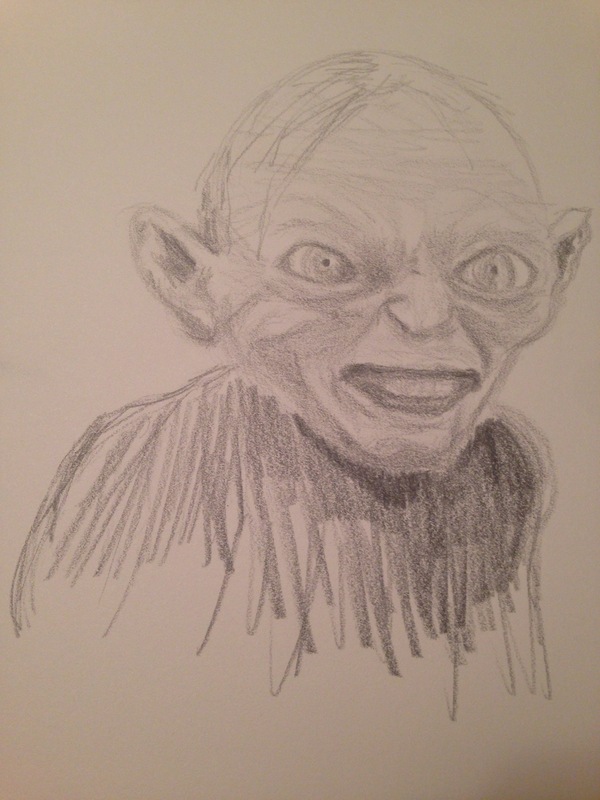 I think the scratchy, energetic shading brings out the character of Gollum in the first illustration. It suggests a feeling of unease. Thanks, Graham. Good point. I need to consider that type of thing when I’m drawing. Always appreciate your comments.